Founded in 2013 with around $50 million in funding, Doppler Labs placed a bet with the consumer electronic marketplace that their DUBS acoustic filters and Here One wireless smart earbuds would be a raging success. 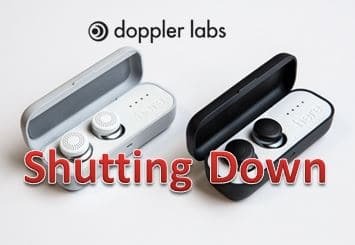 Fraught with battery life issues and other problems with its recharging case, Doppler Labs shuttered its doors on November 1. The decision to close the company was made by its founders, Noah Kraft and Fritz Lanman, after spending the summer trying to secure an additional $35 million in funding to keep the company afloat. The company had planned to launch a new version of the Hear One app for people with hearing loss this December. The new app, Here Plus, was said to have an accompanying service component, and, according to the current Doppler Labs website, it can be downloaded for free from the Apple App Store. The Here One device had a promising start last year, as it received favorable press about its design, easy-to-use software and real-time language translation feature. However, sales of the hearable were weak, as it reportedly sold only 25,000 units (with another 15,000 sitting in a warehouse). Unfortunately, if you are an owner of one of these 25,000 units, you have until December to receive service support from Doppler Labs, according to their website. Just a few years ago, when Kraft and Lanman first raised money for Doppler, the audio gadget industry looked ripe for startup disruption. Several similar start-up companies, such as Pebble, Jawbone, and Xiaomi looked like burgeoning players in the growing consumer audio field. Large mainstays, such as Apple which paid $3 billion for Beats, also seemed to be spurring interest in consumer audio. In addition, the recent publicity surrounding the affordability and accessibility of hearing aids attracted the attention of start-ups who attempted to bring low cost personal sound amplification products to market. The closing of Doppler Labs, however, is a signal that entry into the hearing healthcare market by start-ups is risky. According to a recent interview of the Doppler Labs founders, a significant obstacle to company sustainability was hardware costs. Like Doppler Labs, the makers of the now defunct Soundhawk PSAP came to market with considerable fanfare only to be stymied by alleged supply chain issues and poor sales. Hearing instruments are somewhat medical devices. Hearing impaired people, at least most of them, needs very professional services!!!!! !